If you would like a more thorough introduction to the subject, you could try Mark Sainsbury’s Paradoxes (2009) or Doris Olin’s Paradox (2003). 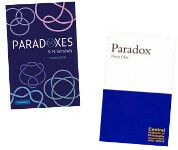 Sainsbury is more succinct while Olin is more relaxed, but both explore numerous logical paradoxes in some depth. Olin also has a handy guide for newcomers! Carl G. Hempel (1905-97) introduced the paradox of the ravens in ‘Le problème de la vérité,’ Theoria, volume 3, 1937, and subsequently in ‘Studies in the logic of confirmation,’ Mind, volume 54, 1945. (These are academic philosophy journals.) As mentioned, he believed that, suitably construed, a herd of pink pigs really does help confirm the hypothesis that all ravens are black. René Descartes (1596-1650) discussed the dreaming problem in his Meditations on First Philosophy, a classic work of philosophy, studied all over the world. He claimed that we could be sure that our lives were real and not a dream because God was benevolent and would protect us from such a deception. Of course, before making this claim, he “proved” the existence of God. Zhuangzi’s butterfly dream is depicted in The Complete Works of Chuang Tzu (Columbia University Press 1968), translated by Burton Watson. Zhuangzi lived in the ancient settlement of Meng (蒙城) in the 4th century B.C., now the city of Shangqiu (商邱) in the Chinese province of Henan. The bicycle problem is from one of Martin Gardner’s recreational math books, but I can’t recall which one. It appears again in his Smart Science Tricks (Sterling 2005). Supposedly, it may be found in Cyril Pearson’s The Twentieth Century Standard Puzzle Book (1907), but I haven’t been able to verify this. The paradox of the heap goes all the way back to Eubulides of Miletus (c. 4th century B.C. ), who belonged to a famous school of philosophers in Megara, a city that continues to exist in modern Greece. The version of the paradox in terms of coloured squares is mine, although it is bound to have been used before, but I have never seen that many coloured squares in print! Newcomb’s paradox was discovered in the 1960s by William Newcomb (d. 1999), a physicist from the Lawrence Livermore Laboratory at the University of California. The Abracadabra version of the paradox, which is an especially simple version, is mine. In its terms, Newcomb himself believed that you should say Abracadabra, but few have agreed with him since. In my opinion, however, Newcomb was definitely right – see my full piece on Newcomb’s problem on this site. Raymond Smullyan’s (1919-2017) cheeky proof of the existence of a unicorn may be found in his book, What is the Name of This Book? (1978). Interestingly, after explaining the flaw in the proof in just three lines, Smullyan suggests that Descartes’s notorious “ontological proof of God’s existence,” which has been discussed for centuries, is flawed in exactly the same way. I haven’t decided whether Smullyan is right, but I suspect that he is!